As this is my first ever blog/race report, I would like to start with something that keeps me pushing hard throughout my training and my short lived triathlon career, which is the fact that I know I might not be the most talented, but I do work and train very hard at all 3 disciplines, a sport which I love, and is called triathlon. Last season ended very bad for me with a DNF at Ironman SA after falling ill on the bike, which obviously left me with a very low level of confidence. I tried to redeem this disappointment with 2 off road triathlons during May and although the results was fairly good (both top 10 overall), the field was small and I wasn’t convinced that my confidence is back where it should be. 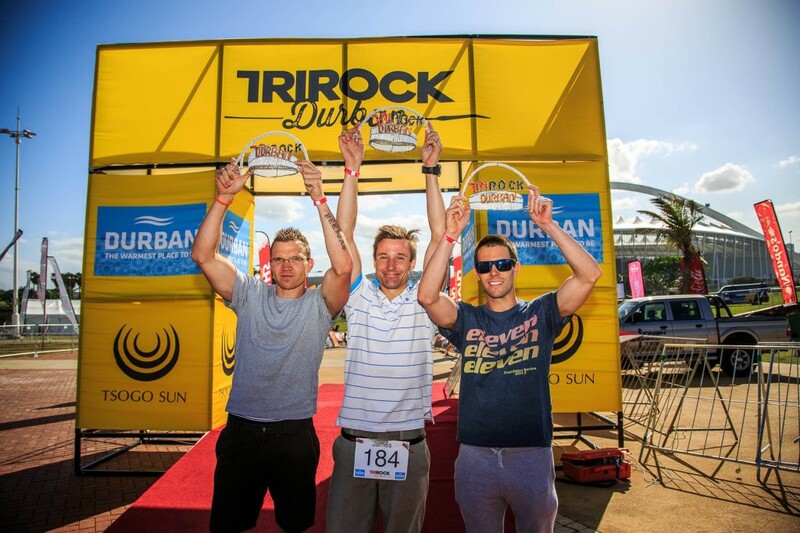 So my quest for the 2013/2014 season started with my first race scheduled for 22 September 2013, TriRock SA – Durban. Even though this was always going to be a real tester of my form for the new season, I approached coach Diana 2 weeks before the race to try something new during my taper week. During taper weeks I always feel lethargic and my legs heavy especially after a few days of taking it easy, so the genius that Diana is worked something special out for me. She kept my training tempo very high, but slightly shortened my workouts the week before the race up until the Wednesday were I had a big tempo swim set in the morning of 3,5km followed by a fairly challenging track running session the evening. As from Thursday my taper started and all I had to do was wait for the big day to arrive. Fast forwarding to race day, it was a 4-30 am wake up for the usual breakfast and going through my race plan for the day, which was pretty much go as hard as you can, but keep something in the tank for a solid run at the end. I normally have a solid swim, so wasn’t too nervous about that at all, just didn’t want to lose too much at the start. As the gun fired I was well placed and ran into the very calm seas and started the swim leg. The swim felt effortless and halfway through it felt like I was loafing and started to push the pace a little. As I moved to the front of the pack no one followed and I was left out on my own. I didn’t have much hope of a fast time as I was swimming completely within my comfort zone, but to my surprise I excited the water in 27mins, 2minutes down to the lead pack of pro’s. Out on the bike the first few kilometers consisted of a short out and back in town with a few loops around the main road, before the bike leg headed out onto the M4 for some fast racing and rolling hills. Unfortunately for me and a small group of guys with me the marshalls got confused and sent us into the wrong direction and we ended up doing parts of the loop in town twice adding extra 4,5km to my total bike leg. When we finally got guided back onto the right track we were way down on the main field and I felt very angry and might have sworn at a few marshalls (for which I feel very bad now). The bike leg is my weakest leg and I was very conscious about not pushing too hard and hurt myself for the run later. I managed to stay fairly calm and slowly throughout the race I moved up through the field and as the km’s ticked by my legs started feeling stronger and stronger. The bike leg went by fairly quickly, although my time doesn’t reflect this as I ended up with a 2:38 (keeping in mind I did an extra 4,5km). I was in a good space and was really looking forward to the run, although I knew I was quite far down on the field. At this time I did not even think about age group or overall positions and just wanted to push the pace as hard as I can through the 21km of running. Me and my good friend, Paul Hilliard, who is a superb runner and came of the bike with me, set out on the run right behind me and I knew this will be an epic battle between the two of us. The run consisted of 3 x 7km loops with 3 turnaround points, and although I told myself never to look back, at each turning point I could see Paul sitting on my heals about 10meters back. We went through the first 10km in exactly 40mins and I was feeling excellent. At this point I was passing a lot of athletes but due to the fairly short laps athletes that were further back on the bike had joined the run and I had no idea of where I was placed in the field. This was the first race my entire family was on the side line and on every lap hearing my name was quite a booster and I kept pushing hard. On the last lap I could feel my legs is starting to hurt, but on each 1km when my Garmin vibrated and I looked down at my pace per km and it was on track, I got some extra kick again. On the last turn I could not see Paul on my heels anymore and a bit further back I saw him walking, and with him always being right up there in our age group, it did cross my mind that this might be something good. I ended the 21,1km in 1:26 with which I am happy. I ended the day 2nd in my age group in a time of 4:38 and 5th overall age grouper excluding the teams. I was hoping for a sub 4:30, but I am by no means disappointed. I am really looking forward to the rest of the season and continue to LIVE AND LEARN more about this fantastic sport and also continue to learn to always listen to my body….. and my super coach! Thanks to everyone who wished me well and supports me in what I love doing, TRIATHLON.